Personman 2 I like the two-player much more than the four. 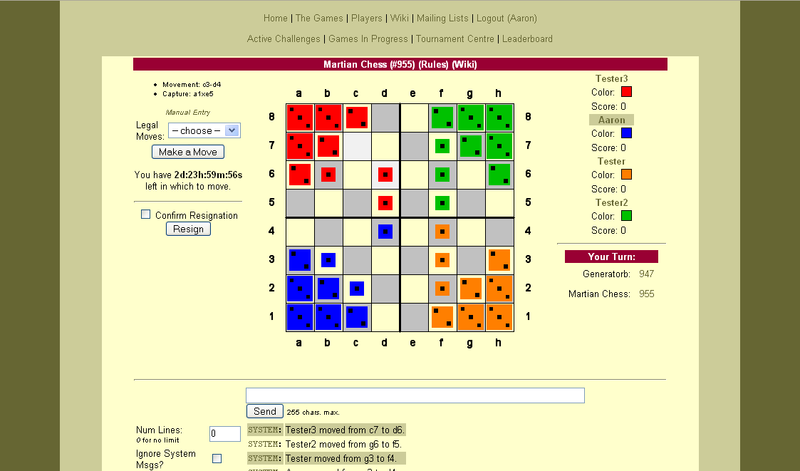 A really nice chess-like game that you can play well without studying for it. CDRodeffer 1 The game feels chaotic, even with two, but that feeling is merely superficial. Cerulean 1 The less you know about Chess, the better you'll do at this one. Draw5PlayAll 1 I'm one of the only people I've played this with *in person* that can easily adjust to the mechanic. Never tried 4P. Does SDG support the 3P version? goulo 1 Looks very simple, but seems to have potential for surprising variety in gameplay. One of the classic Icehouse pyramid games. But there is a problem with occasional draws (infinite loops) in the endgame sometimes. Jesse 1 I quite enjoy this as a 3-4 player game. I'll pass on 2 players, though. ryanker 1 Not JUST another pieces-on-a-chess-board game. Having the pieces change ownership based on where they are is a nice twist. stoneaxe 1 I love these icehouse games! Martian Chess and Pikemen seem similar to me. They both try to score points by capturing opponets. I enjoy them both! unic 1 Clever chess variant. ZackStack 1 I like playing this 3-6 players tabletop and have enjoyed my 4 players games on SDG quite a bit. Aaron 0 I find the 2-player version very drawish, with correct play. The 4-player version is at least decisive. Babamots 0 I find four-player pretty painful. It's mostly a matter of who decides to trade points with whom (people seem to think it's funny to shut me out). Two player is dull until I make a mistake and have to try to wriggle out of it. bigby 0 The piece possession based on location is an interesting mechanic. Haven't yet played with four. nycavri 0 Less "Chess-like" than Pikemen, Martian Chess has a unique dynamic. The 4-player game is far more satisfying than the very dry 2-player. Zotmeister 0 It's easy to see MANY moves ahead, but perhaps not as helpful to do so as it ought to be. Way too drawish.